Libraries are not the usual place that you would expect to go for a fun sing-along, but that is definitely the case with a new lunchtime sing-along session that will start at the Cardiff Central Library Hub on Tuesday November 3, 12.30-1.30pm. It will be led by ‘cover girl’ 85 year old Hilda Mooney from Barry. 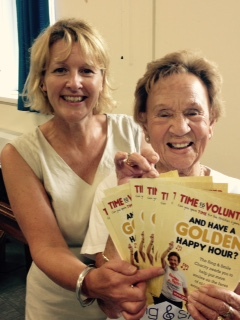 Hilda Mooney with Goldies CYMRU Programme Leader Rachel Parry. The Goldies CYMRU Charity is spreading across Wales with its daytime singing and activity sessions for older vulnerable people. The charity was started by Bath-based music man Grenville Jones eight years ago and launched in Wales in 2011 with the support of the Wales Lottery, the Moondance Foundation and The Rest Grant scheme. Working in close partnership with a number of town councils, the Coal Industry Social Welfare Organisation, Age Connects Cardiff & Vale, churches and community groups Goldies CYMRU has spread across South and West Wales. Hundreds now attend the sessions. “There is so much going on in Cardiff libraries and we are delighted to be working with Goldies CYMRU on this new initiative for the Central Library Hub. We have already hosted Goldies sessions in branch libraries but now we are delighted to welcome a new session in our flagship facility in the heart of the city centre. “The lunchtime sing-along session is the perfect opportunity for people working nearby or shopping in the city to pop in and join in with some old favourites with Rachel Parry, Goldies CYMRU Programme Leader and the charity founder, Grenville Jones. On that day Goldies CYMRU will also launch its new book of Welsh folk songs and singer Nia Ann will be performing some of the songs. By the close of 2015 there will be over 40 daytime singing sessions across Wales. The charity also has a hugely successful schools intergenerational programme called Time after Time and to date over 60 schools from across Wales have taken part with events that include older people from their local communities. Hilda Mooney is 85 years old and never misses her regular Barry Goldies CYMRU session. She was one of the first people to attend when the session started four years ago and she loves to sing the Goldies songs. ABBA and Tom Jones are her favourites and pictures of her feature on all of the Goldies publicity materials. “Hilda is such a lovely lady, so full of energy and she will be coming to the session at Cardiff to show everyone her “moves”. She has a huge appetite for life and I know that our charity and attending the singing sessions has really brought so much joy to her and her friends.